Actor, director, producer, writer, audiobook narrator, photographer and cultural ambassador. Gabriel Byrne keeps himself busy. Originally from Crumlin, Dublin, Ireland, Byrne moved to the United States in 1987 and has since appeared in many films, including The Usual Suspects and Stigmata . He currently stars as Dr. Paul Weston in HBO’s In Treatment, which focuses on his weekly sessions with his patients, as well as his own therapy sessions. 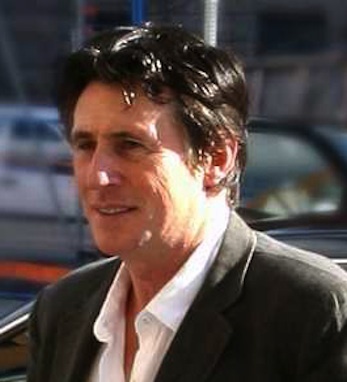 Byrne’s work on In Treatment has earned him a Golden Globe award and an Emmy Award nomination in the Best Lead Actor in a Drama Series category. Currently, Byrne is the Cultural Ambassador for Ireland and at the forefront of Culture Ireland’s yearlong series of programs in the U.S., Imagine Ireland. He considers the program not only a celebration of the rich imagination of Irish artists past, present and future, but also a challenge to the America public to imagine Ireland for themselves. Besides being the public face of the exhibition, Byrne is curating a film retrospective in association with the Irish Film Institute and the Museum of Modern Art at MoMA in May as part of Imagine Ireland. Byrne has two children from a past marriage with actress Ellen Barkin.